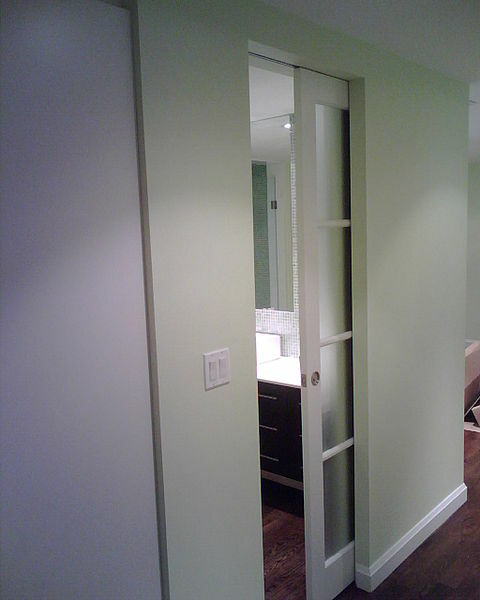 Start your pocket door installation by measuring the height, width, and depth of your door frame. Decide which side of the wall you want to extend and by how much. After that, use your pry bar to remove the molding around your door frame. Be careful not to damage the wall or the molding. Next, remove the wood and the wood shims inside the door jamb. Attach your new add-on wall frame by nailing it to the ceiling and making sure the top is level. Install a bottom plate and make sure it’s level with the top. Insert wood shims where needed in order to create a sturdy door frame. Next in your pocket door installation is the track. Install your pocket door track according to the manufacturer’s specifications. After that, measure and cut your drywall to fit over your add-on wall. Use your screwdriver and screws to attach the drywall to the add-on wall frame. Next, mix up some joint compound and use a trowel to apply a thin layer to your joints. Let the compound dry completely, then use your sanding block to sand down any rough or bumpy surfaces. Apply another thin layer of joint compound and let it dry. If desired, repeat steps 13 and 14 for a third layer of compound. Apply a layer of primer to your pocket door and let dry. Then, paint the door the color of your choice. Attach the wheels to the top of your pocket door and hang the door by inserting the wheels into the track. Paint your wall, then reattach your molding and nail into place.